If your family uses a holiday tree during the Yule season–and many Pagan families do–you might want to consider a blessing ritual for the tree, both at the time you cut it down and again before you've decorated it. 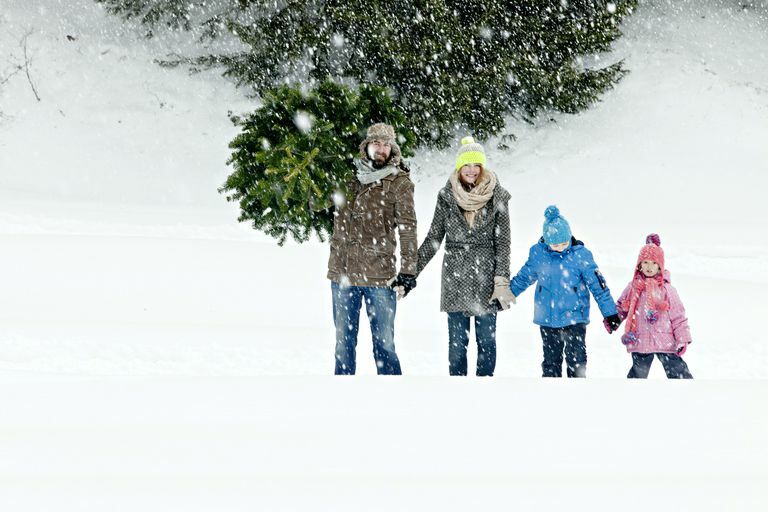 Although many families today use fake holiday trees, a cut one from a tree farm is actually more environmentally friendly, so if you've never considered a live tree, maybe this is a good year to start a new tradition in your househould. First of all, make sure you're in a place where you have permission to cut trees. Either find a local Christmas tree farm, or if you're on private property, get the approval of the landowner before you cut anything. Never cut a tree down in a park or forest without permission. Don't just randomly start hacking away at trees. Take some time to wander around and find the tree that's right for you. Often, you'll know the right tree when you find it; it will be just the right height and width, the exact fullness you want, and so forth. In our family, our annual tradition is that we only cut down our tree if it has a bird's nest in it (obviously, by December the birds don't need it any more, it's just something my teenager started as a child). If you've found the right tree, take a moment to touch it. Feel its energy flowing from the earth and into you. Recognize that once you've cut it down, it will no longer be a living thing. In many traditions, people find it comforting to ask the tree for permission to make the first cut. In Dorothy Morrison's book Yule, she recommends asking the tree to move its spirit deep into the ground so that it will not feel injury or pain when you cut the trunk. O evergreen, mighty tree, you who are full of life. I am about to make the cut, and ask your permission. adorning you with light in this season of the sun. We ask you, o evergreen, to bless our home with your energy. Evergreen, evergreen, big fat tree! I ask you now please to come home with me! and let you shine about our house at Yule, the longest night! we'll plant another in your name, when spring comes our way! Make the cut about eight inches above the ground, and cut quickly. Be sure to make sure no one is standing on the opposite side when the tree begins to fall. Using the gloves to protect your hands if necessary, tie the rope around the trunk so you can pull it out of the area. Before leaving, push the fertilizer sticks into the soil near the cut trunk. This will promote new growth from the remaining stump. If you can, periodically stop by and add more fertilizer sticks to the newly sprouted branches. You may wish to also leave some birdseed on the ground as an offering to the wildlife in the area. Some families even use the birdseed to cast a protective circle around the stump where they've cut their tree down. Finally, if you've promised to plant a new tree somewhere in the spring, be sure to keep your word. Decorating a Yule tree is a lot of fun, and should be a celebration of family. Put on some holiday music, light some incense or scented candles, get a pot of herbal tea brewing, and turn it into a ritual of its own. Before you decorate, you may wish to bless the tree once more. stable and strong in our home throughout the Yule season. and we welcome the brightness of the new into our hearts and home. yet the warmth of the sun is returning, bringing with it life. so that we can enjoy the harmony and peace of Yule. As you say the blessing, sprinkle the salt around the tree in a circle (not on the tree, just around it), smudging with the incense, passing the candle over it, and finally, adding water to the tray at the bottom. Once you've finished the blessing, decorate your tree and celebrate!